Q. What is sustainable energy? A. Sustainable energy is best thought of as energy which can be replenished within a human lifetime and which causes no long-term damages to the environment. Solar energy, wind energy and geothermal energy, amongst others, are all self-sustaining. They all have sources that cannot be depleted. Extended use of these energy sources aids the conservation of other non-renewable energy sources such as fossil fuels. Q. How does solar technology work? A. The idea behind technologies which use solar energy is to harness the freely available rays from the sun in a useful form. The technology used for solar water heating is simple and effective. The basic principle uses an absorber plate which is heated by the sun's rays. This heat is collected in a transfer liquid which is in turn used in a heat exchanger to heat water. Q. What if there is no sun or it is a cloudy day? A. Special coatings are available on the absorber plates which allow the collector to absorb energy from diffused as well as direct sunlight. This means the panel can still yield results on days when there are clouds in the sky. Q. Is there any Government funding available? A. The Department for Business Enterprise & Regulatory Reform (BERR), formerly known as the DTI, is funding an initiative called the Low Carbon Building Programme which entitles home owners and not-for-profit organisations to financial help with a solar system when installed by an approved installer. Q. Do I have to pay VAT for installing solar panels? Q. Do I still need a boiler? A. Solar heating on a normal domestic scale in the UK will provide around 50-70% of the average annual household hot water requirements. Although the system may provide most of the hot water required in summer, the winter results, due to the lower intensity of the sun and the shorter daylight hours, will be reduced. As such the householder will need a boiler (or suitable alternative) to make up the difference in domestic hot water requirement and for the central heating of the house. Q. Do I need to have a particular type of roof for Solar installation? A. 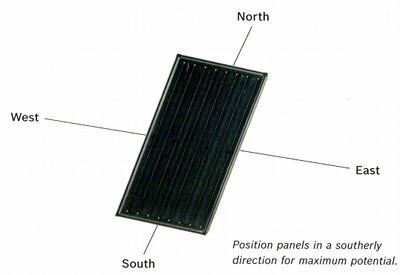 In the UK the best orientation for solar panels is facing due south and tilted at between 30 and 45º from the horizontal. The gains available will reduce as the orientation moves away from due south. A variety of brackets and frames are available for solar systems to suit different roof types (pitched and flat) and different types of roof tiles.